At present, this superfamily consists of 36 genes which encode 41 cytosolic GST proteins in the proteome. Using this information to generate specific primers and a Drosophila S2 embryonic cell line for mRNA template, we performed RT-PCR and obtained all 41 GST coding sequences for recombinant heterologous expression. Current annotations of the database show 19 of the 36 GST genes possess a single exon that encodes the full length protein. At present, seven classes of mammalian cytosolic GSTs have been identified; Alpha, Mu, Pi, Theta, Omega, Sigma and Zeta. In fact the last four classes, Theta, Omega, Sigma and Zeta, appear to exist in all eukaryotes. D. melanogaster has these four classes plus two additional classes, Delta and Epsilon. In D. melanogaster, every GST in these ubiquitous 4 classes (Theta, Omega, Zeta and Sigma) is encoded by multiple exons and every class has a gene that generates multiple transcripts. Upon further examination of the Drosophila database it can be observed that all 6 classes of GSTs have 1 or more genes that generate alternative transcripts. Alternative splicing increases protein functional diversity as well as increasing proteome complexity. However, for 4 genes these multiple transcripts do not encode different proteins, although a different 4 genes that generate alternative transcripts yield 9 different proteins. 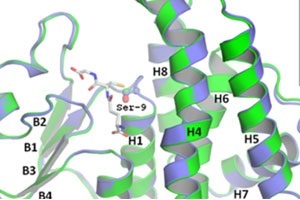 Variable splicing seems not to occur in the region that disrupts active site topology, including the G-site and H-site, therefore this implies that these catalytic and substrate binding moieties are conserved to maintain similar functions. Only one third of the DmGSTs could be purified by GSH affinity chromatography (GSTrap). None of the Omega, Theta and Zeta class members could be purified by conventional GST affinity chromatography. Therefore it was necessary to individually develop purification protocols for these 14 enzymes. Each of these proteins was successfully purified to >90% by different protocols although some enzymes are members of the same class. This suggests that each individual enzyme, even the alternatively spliced products, possesses unique physical characteristics. These enzymes were also characterized with various substrates including several putative physiological substrates. This study shows that these proteins possess broad overlapping substrate specificity which also implies functional redundancy. However, the individual enzymes display distinct properties suggestive of unique physiological functions. Furthermore these results suggest that the enzymatic function of a GST does not correlate with the criteria for classification. All 41 GSTs are expressed, at least as mRNA, in Drosophila melanogaster S2 cells, an embryonic cell line. This observation raises the question of: why is an embryonic cell expressing the complete GST proteome? Each of these enzymes, including splice products, possessed different physical and chemical properties as shown by heterologous expression, individual purification protocols, CDNB and GSH kinetics and substrate specificity for potential physiological substrates. The presence of so many isoforms and the differences between the enzymes’ characteristics suggest that these GSTs have important and distinct functions in the developing embryo as each protein appears to be unique. To our knowledge, this is the first report of an organism’s whole GST proteome being expressed and characterized as enzymes. We have also obtained several new structures of these DmGST proteins. Genomic organization of Drosophila GSTs. Thirty-six Drosophila GST genes are locate on chromosomes 2R, 3 arm R and L and X. Four genes are alternatively spliced (indicated by subscript letters) resulting in a total forty-one encoded proteins in the proteome. The genes are shown as arrows indicating direction of transcription. Three dimensional structure of Drosophila melanogaster glutathione transferase GSTD10 without bound GSH and with bound GSH (D10GS). Ribbon representation of D10 and D10GS are shown in blue and green color, respectively. Glutathione substrate is in stick and Serine-9 in ball-and-stick. An inset shows GSH interacting residues.